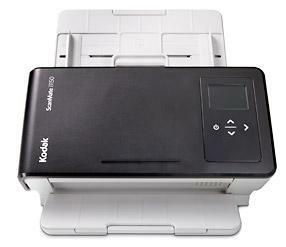 KODAK SCANMATE i1150 Scanner Scanners process transactions at the speed of business. Transaction mode speeds up 60% to capture the first 10 documents in a stack faster, then returns to normal speed scanning. Reads barcode values and delivers data to applications. Convenient card holder keeps materials organized. Kodak Alaris' Perfect Page technology includes state of the art enhancement functions that improve the image quality of scanned documents. Quickly send data to the right places and people, including the Cloud or Web via easy, icon-based color interface and one button Smart Touch functionality.